Over at Gingersnaps Creations is our “Once In A Blue Moon”, challenge and you can pick your challenge. So when I saw that Sharon chose Office Labels I said I have not done these in ages…. Therefore, here is my challenge piece. 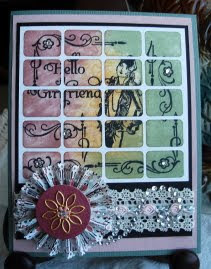 I used the 5/8” x 7/8” labels and Tim Holtz’s Distress inks. 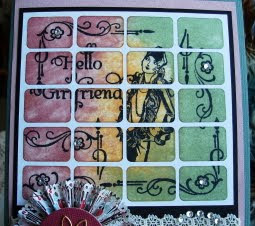 My stamps are from Crafty Secrets. The punch is from Martha Stewart, “Embroidered Floral” and some lace and rhinestones. Thanks for stopping in, and I would love to see your creations. Due Date is Jan.25.2011. Labels: Gingersnap Creations Challenge . Vada, again the beauty in your card is amazing! 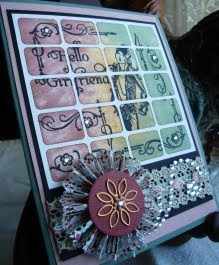 I love that you even added bling to the stamped flower centers. Your rosette is gorgeous! You just always WoW me! Stay warm! Love your interpretation of Shar's challenge. The colour combination is brilliant. ohhh I haven't done these in ages either! Beautiful Vada and adore the added bling and rosette.